I don’t think I’ve ever looked at one of my well thought out pictures and hated it. Maybe I’ve been frustrated with it being out of focus or annoyed with some element that I should have changed, but I have not outright hated an image I created. Photography is a craft of heartache. I say this because it is an art of great hope. A hope that all of the elements in the frame would come together to capture that magical moment. That one would be able to actually articulate a thought a feeling an emotion a sense of awe. Yesterday I felt a mile high. I got home from an evening shoot with beautiful light. Some dramatic clouds and I had made it to my pre scouted location with ample time to set up and shoot. And shoot I did. I framed reframed bracketed and panned my way through 7 or 8 dozen shots. I thought I had it cased. I thought even as a worst case I would just have to exposure blend and everything would be great. Even my spot checks on my lcd suggested I had nailed the exposure and composition. Today however was a day of heartache. I could not interpet what was wrong. Was it motion blur? Dynamic range? Color cast? Something was lackluster and in one image I would love the sky but absolutely hate the foreground or love the framing and hate how the sky turned out. I spent over an hour trying to exposure stack a panorama. I never did get it to work. Then the regret. Why didn’t I take more time to set up. Why did I break the golden run and handshoot something I could have used a tripod for. Why didn’t I pull out my nd filters and try to get it even closer to right in camera? I’d love to say I have learned all these basic photography methods, but clearly I believe I am the exception. This is a tough lesson to learn. Don’t get me wrong, some of my pictures turned out just fine, they just aren’t what I had hoped. So In my commitment to this process outlined is the process below. First I shot a 5 frame pano at three different shutter speeds. I should have used a tripod and a much greater DOF say F16 or F22, but that ship sailed. 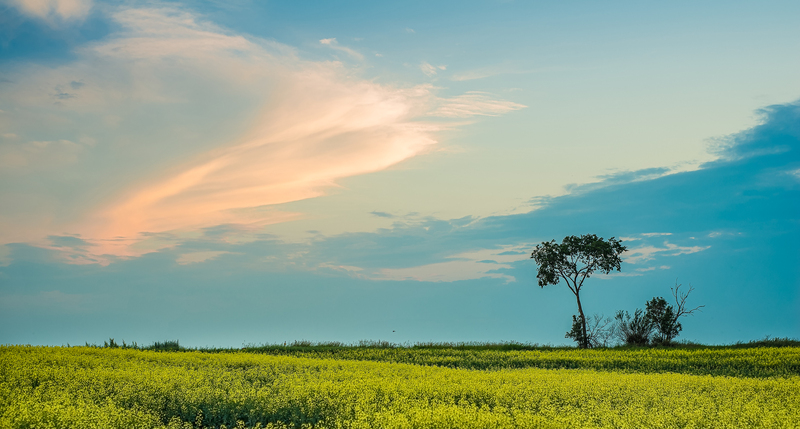 I didn’t realize how noisy the foreground flowers would be and with no real focal point you can see your eye dances around the field quite a bit. 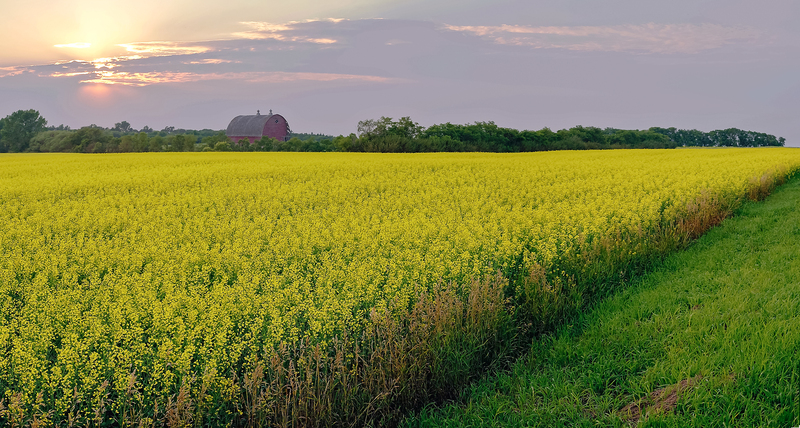 I think a tighter crop would probably serve the image well, and getting a touch closer to the barn I could have stitched say 7 images together instead of 5, but I shot from the roof of my car from the road and wasn’t about to go driving through some farmers canola field. After i stiched the images I tried numerous times to actually process and HDR with the 3 different panoramas and even tried manually exposure stacking them, but since I hand shot three different sets of images I was unable to align the highlights the midtones and the shadow images properly. So I had a choice. I could publish the abismal images I got (which are not shown here – although I could probably post an example if anyone is so much interested) or I could forge on. I did process a few other images from the shoot which I kind of liked (see below) but that was hardly the point, so I forged on. With several attempts in photoshop and even one effort in lightroom I managed to take the underexposed images and tone map and caress my way to what you see. I’m still not convinced these images are entirely publishable, but I feel a whole lot better about them than my first 20 attempts. So what exactly did I do. I compressed the highlights bumped the exposure even further I added some serious gain to the shadows and blacks and finally added some contrast. I tried to reduce the noise a bit and sharpened the images. Overall fairly minor adjustments. I won’t share any “secret sauce” post processing tips because the truth is, if it’s worth shooting it is worth shooting right in camera. My best to all of you. Thank you for your kindness your likes and your follows. 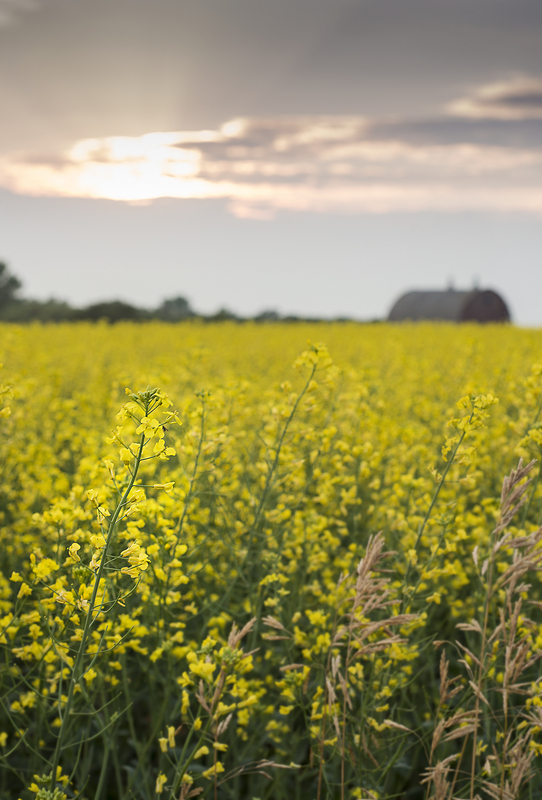 This entry was posted in 2014 Photo Project, Photos, post processing, Uncategorized and tagged barn, bloom, canola, field, flowers, lightroom, panorama, photo, photography, photoshop, sunset, yellow. Bookmark the permalink.